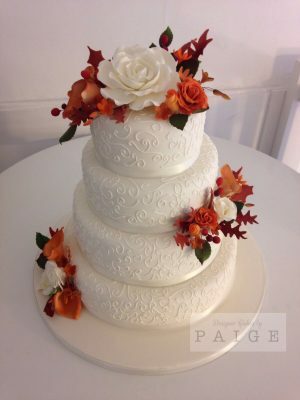 A classic ivory iced cake with vintage piping is perfectly accented with these autumnal flowers and foliage. Perfect for an autumn wedding for a natural, elegant look. 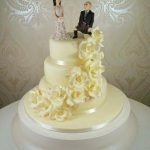 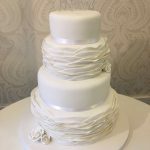 This grand 4 tier wedding cake is made up of standard height 6″, 8″, 10″ and 12″ round tiers and will serve up to 150 portions. 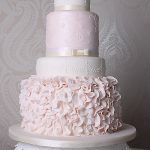 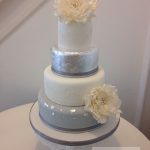 Although made out of edible materials, it is not recommended that the sugar flowers be eaten and must be removed before serving.